1.) The monitor connected to the DisplayPort is recognised as a built-in display rather than an external monitor. Edit: Toleda suggested to change AAPL,ig-platform-id to 0x0d220003 but it turns out that I am already using it so that cannot be it. I also noticed that the DisplayPort connector is on port 0 which may be wrong. Edit-2: Yup. I patched AppleIntelFramebufferAzul.kext and now it is using port 7, instead of port 0, and as a result the monitor is no longer recognised as a built-in display. I guess that settles it. 2.) The used image for the monitor is wrong. Edit-2: Also solved by the AppleIntelFramebufferAzul.kext patch. 3.) The monitor connected to the HDMI port has a maximum resolution of 1920 x 1080 and requires EDID* edits. 1.) Has anyone ever solved this built-in / image problem before? 2.) Has anyone a working HDMI EDID* edit or know how to do this? Mirroring enabled 2560 x 1440 on two of the three monitors, connected to DisplayPort and DVI connecter, but that is clearly not what I want. I need full control over the displays. However. This seems like a step closer to a real solution. This also counters something that ‘bcc9’ said. That this motherboard does not support dual-link DVI. Well. Mine certainly does. I had some issues to get my Gigabyte GA-Z87MX-D3H motherboard to boot with a Displayport 1.2 cable plugged-in, but covering pin-20 (lower right corner) with a small piece of tape solved this problem. Thanks. I do know how to extract the EDID ,and I do know what the problem is, but I am too busy with other stuff and thus I was kind of hoping that someone else got it going. Saving me some time. Sorry Pike but I think you are SOL on this one…it seems so you will be limited to DVI-D and DP to get 2560×1440, as their HDMI does not appear to support full v1.3+ spec and has limited the clock rate. HDMI (1.4a) on this Gigabyte motherboard supports 4K with a Haswell CPU, be it with a limited refresh rate of 24 Hz, but 2560 x 1440 works at 60 Hz in mirror mode here (the screenshot shows one Dell monitor connected via DisplayPort and the other via HDMI, both with 2560 x 1440) so that should be fine. The problem here is the returned EDID, which returns the wrong data. 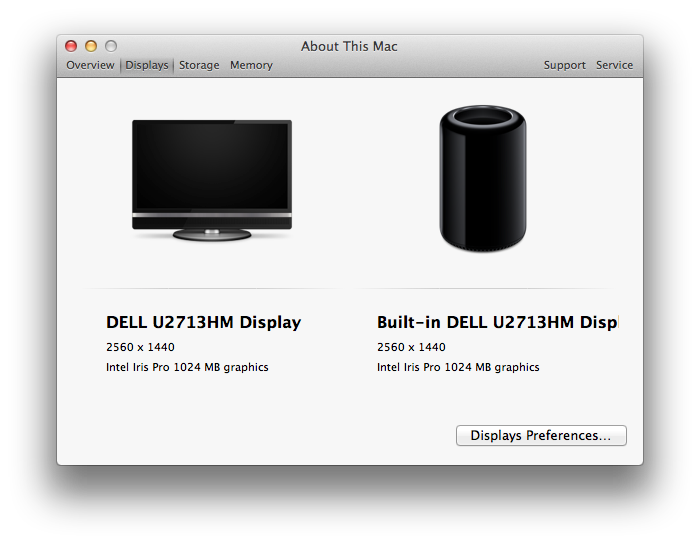 I guess that Dell wants us to get the more expensive ones (U2713H) as that returns the correct info with higher resolution. Oh so Dell’s HDMI actually does accept the signal greater than 1920×1080 but does not report the resolutions back? Both HDMI devices have to support the same spec and clock rates in order to work, afaik. Maybe you can find a tool to flash the monitor firmware then update the EDID with your own version that way? It’s working fine except for some mouse lags/jumps when the HDMI TV is connected, but turned off. I’m not up-to-date about Ozmosis, other than it includes a HFS driver, which we had going long before anyone else did that. Thanks to Dave – I even think that he was the first person to do that. Also. Booting in non-legacy mode makes it easier to get stuff going, but I want/need legacy mode to support it. I’d also like to see what a proper DSDT really means… feel free to e-mail it. Thanks. Hi Pike, i do not know if this method could be used to fix your situation, but it fixed a /similar/ issue i was having on my fathers rMBP HDMI out by creating an override with the correct monitor settings. The script plus your knowledge may allow you to create the settings and override you need. It doesn’t seem to fix the issues I am having with my Dell monitors, but it is still interesting to see what people run into with Apple and then come up with in terms of workarounds and other patches. Thanks! Pike, I’m interested in knowing what about the FBAzul patch fixed the status of the second monitor as being built-in. I know it was a while ago you posted this, but if you have any suggestion, it’d be appreciated. That gave me port 7 instead. Also. Don’t use: 3000 0000 as connector attribute, because that is port 0. That did it! No more “built-in” and port is now 0x7. I’d read that you had changed the 11 to 00 for HDMI audio but it didn’t occur to me that it would help with the “built-in” issue. Thanks for making that connection for me. I’m guessing by “port attribute” you mean that in your example, the original port attribute is “1100 0000” and that therefore, replacing the “11” with “30” would not be good either. And believe it or not, that’s exactly what I had done. Why did I pick “30”? I must have seen it in another example and thought that was a good value to try! Figures I’d make it harder on myself. I’m glad to hear that. And you are welcome. Have fun now! Even though I have the displays in the “right” places (not “built-in”), the computer hangs on screensaver, sleep, or shutdown/reboot. Nothing written to system log file. Looks like I’m not quite there yet. I have two DP connectors on the computer (Dell Optiplex 9020) and both are hooked up to monitors via DVI cables with passive adapters. The problem goes away when I substitute in a DP monitor for either of the DVI connected monitors or when I have only one monitor connected through either DVI or DP. So it seems to be something about the way MacOS/FBAzul is handling the existence of two DVI monitors. If you have any suggestions on what I should pursue, fire away. Thanks! I am going to assume that it is a real hang, and that power management is working, and what I would do in this case is that I would change the port-attribute of the first frame buffer (port 5) for the VGA connector to 3000 0000 to change it into port 0 and then to experiment with the port- and connector-attribute values of the two frame buffers for the DisplayPort connectors. Good ideas. Unfortunately, no joy. The computer just seems “happier” when one of the two monitors is hooked in through DP instead of both through DVI. I have analyzed the IOreg for differences between when the DP and DVI are hooked up and found one difference that seems worth looking into: The DP one has a property named IOScreenRestoreState on all 3 framebuffers while the DVI one doesn’t have the property at all on any of the framebuffers. I think I’ve probably veered far away from the original post and topic here, though, so if you have a suggestion on where I should best post this question, let me know! For anyone experiencing a problem similar to mine with the two DP to DVI adapters, I gave up trying to do it with two passive adapters and am now using one active and one passive DP to DVI adapter. That made MacOS happy – just as it was when one of the monitors was really connected via DP. I should note that I did have to make sure that the active adapter was on the second port picked up by the BIOS – when it was on the first with the passive on the second, I got a hang on startup with an all white screen. That’s worse than when it was two passive adapters where it would boot up just fine but then flake out when putting the display to sleep (not “screensaver” as I wrote before but “display sleep”), shutdown/reboot, or sleep. Also interesting that the IOScreenRestoreState property didn’t show up in the IOreg after this workaround. So good thing I didn’t chase that for too long and discover it got me nowhere. Pike, thanks again for the help here in the comments and for the great info on your site.